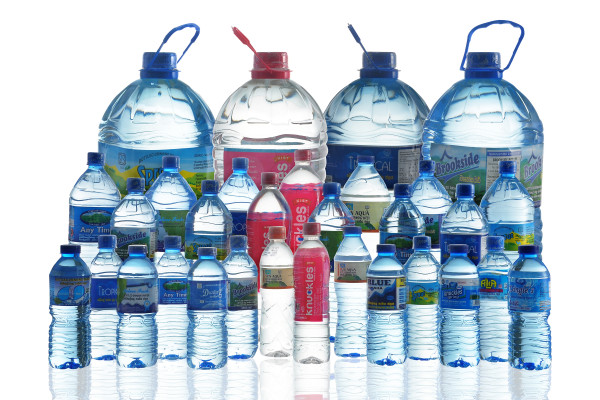 The soda bottle so common today is made of Polyethylene Terephthalate (PET), a strong yet lightweight plastic. PET is used to make many products, such as polyester fabric, cable wraps, films, transformer insulation, generator parts, and packaging. It makes up 6.4 percent of all packaging and 14 percent of all plastic containers, including the popular soft drink bottle. 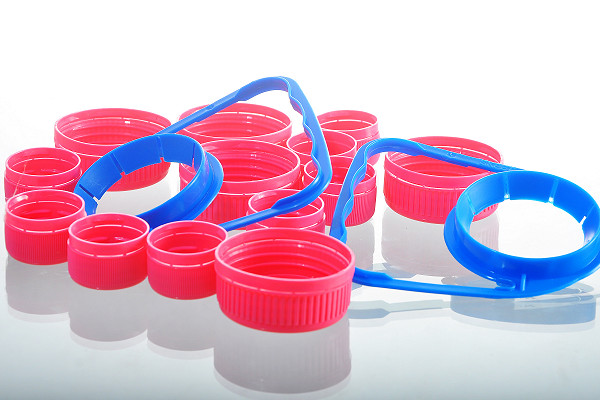 Accounting for 43 percent of those sold, PET is the most widely used soft drink container. Aluminum, a close second, is 34 percent, while glass, which used to be 100 percent of the bottles, is only a small percentage of those sold today. 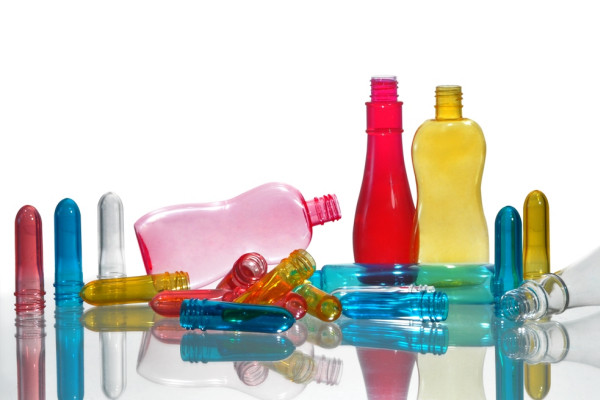 Before the bottles can be made, the PET itself must be manufactured, or polymerized. In polymerization, smaller molecules are combined to form larger substances. To make PET, terephthalic acid is first combined with methanol (CH 3 OH). This reaction yields dimethyl terephthalate and water. Next, the dimethyl terephthalat, is combined with an excess of ethylene glycol at 305 degrees Fahrenheit (150 degrees Celsius) to yield another substance, bis 2-hydroxyethyl terephthalate and methanol. The final step of polymerization involves the condensation polymerization of the bis 2-hydroxyethyl terephthalate. In this process, a polymer is formed while another molecule is released, or "falls out." The condensation polymerization of bis 2-hydroxyethyl terephthalate is carried out in a vacuum at 530 degrees Fahrenheit (275 degrees Celsius) and results in chains of PET and ethylene glycol (see step #1 above); the latter substance is continuously removed during polymerization and used to make more PET. After the PET mixture reaches the required viscosity (thickness), it is cooled to avoid degradation and discoloration. Later, it can be reheated for its various uses. 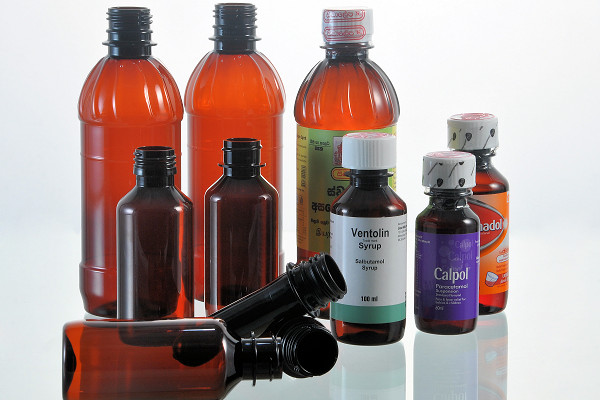 PET beverage bottles are made using a process known as stretch blow molding (also called orientation blow molding). First, PET pellets are injection molded—heated and put into a mold—into a thin walled tube of plastic, called a Preform/Parison. The Preform is then cooled and shaped to the proper size/length. Next, the Preform tube is re-heated and placed into another mold, which is shaped like a soda bottle, complete with screw-top. A steel rod (a mandrel) is slid into the Preform. 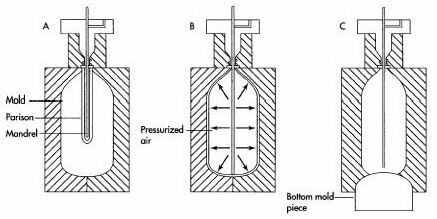 Highly pressurized air then shoots through the mandrel and fills the Preform, pressing it against the inside walls of the mold. The pressure of the air stretches the plastic both radially ("out") and axially ("down"). The combination of high temperature and stretching in the desired direction causes the molecules to polarize, line up and essentially crystallize to produce a bottle of superior strength. The entire procedure must be done quickly, and the plastic must be pressed firmly against the wall, or the bottle will come out misshapen. 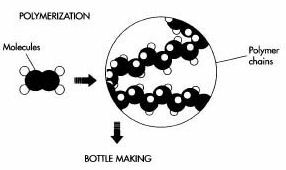 In order to give the bottom of the bottle its proper concave shape—so that it can stand upright—a separate bottom piece is attached to the mold during the blowing process. The mold must then be cooled. Different cooling methods are used. Water in pipes may flow around the mold, or liquid carbon dioxide, highly pressurized moist air, or room air is shot into the bottle to cool it more directly. 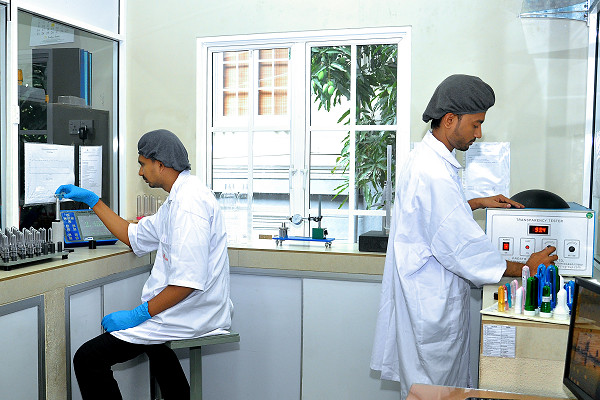 The procedure is preferably done quickly, to set the bottle before creep (flow) occurs. The bottle is then removed from the mold. 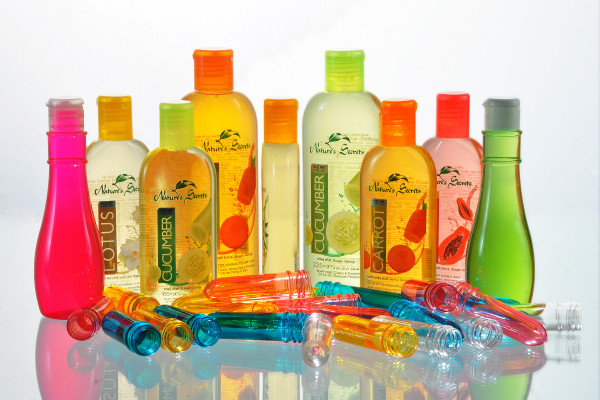 In mass production, small bottles are formed continuously in a string of attached bottles that are separated and trimmed. Other trimming must be done wherever the plastic leaked through the cracks of the mold (like the way pancake batter does when squeezed in a waffle maker). Ten to 25 percent of the plastic is lost this way, but it can be reused. 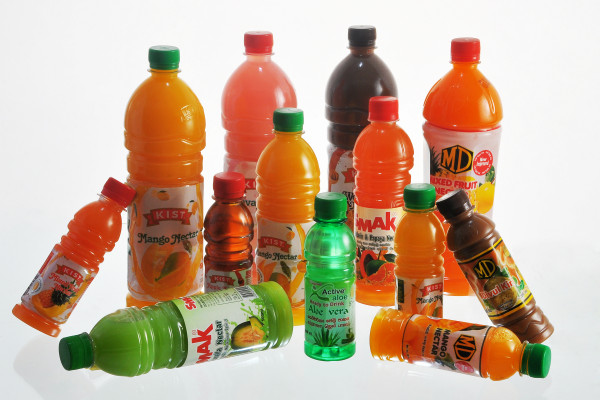 Some soft drink producers make their own bottles, but usually finished bottles are sent from specialty manufacturers to soft drink companies in trucks. Plastic is cheap to transport because it is light. 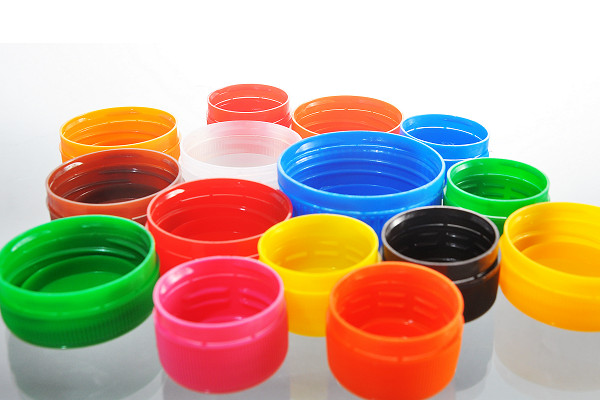 Accessories such as lids and labels are manufactured separately. 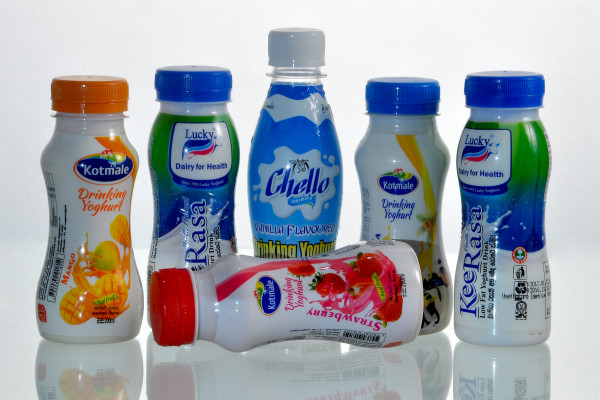 Occasionally, the plastic bottle manufacturer will put labels supplied by the soft drink company on the bottles before shipping them.